When it comes to concealed carry handguns, size and caliber are two of the most important factors to consider. In this guide, I'll cover why you may want to choose a single stack handgun chambered in 9mm. I'll also breakdown our picks for the best single stack 9mm subcompact pistols. For those of you who already know why you want a single stack 9mm pistols, click here to jump to our picks. Our top picks for best single stack pistol are the SIG Sauer P365, Beretta Nano, Ruger LC9S, Springfield XDS Mod 2, Glock 43, M&P Shield 2.0, and the Walther PPS M2. *Prices accurate at time of publishing. What is a Single Stack Pistol? Why is it often preferred? A single stack pistol is one that uses a single stack magazine. As the name suggests, cartridges are only stacked one on top of each other, rather than side-by-side in an alternating fashion. Not Looking for a Single Stack Pistol? Check out our guide to all the best 9mm pistols here. The most obvious benefit of pistols designed to be used with single stack magazines is their width. Naturally, single stacks are thinner than double stacks. For instance, when comparing the Glock 26 (double stack) to the Glock 43 (single stack), the overall width of the Glock 43 is 0.2 inches thinner (1.26 in vs 1.06 in). This may not sound like a lot, but the near 16% decrease in width goes a long way in being able to comfortably concealed carry the Glock 43. The decrease in overall width and slide width, combined with single stack pistols carrying less ammunition, also makes them a fair bit lighter than double stack pistols. Again comparing the Glock 26 (25.75 oz with loaded magazine) to the Glock 43 (20.64 oz with loaded magazine), the single stack pistol is 5.11 oz lighter (~20% lighter). As just mentioned when comparing weights of single stack vs double stack pistols, single stack pistols have a lower magazine capacity. This is obviously a pretty big negative. With that said, the decreased width and weight can make it far more comfortable to carry. It's better to have a comfortable firearm you'll actually carry, then one with a larger capacity that will stay at your house. 9mm is the most popular caliber for concealed carry. It's difficult to get exact figures of how popular it is, but a poll on the USA Carry forum had 40.01% of members choose 9mm as their favorite concealed weapon caliber. As discussed in our comparison of pistol calibers, the FBI and many police forces have transitioned to 9mm from larger calibers in recent years, largely because 9mm offers similar levels of stopping power, while having less recoil. This effect is even more pronounced when talking about ultra small and lightweight subcompact pistols. When choosing the best pistols of any category, it's important to note that there are a ton of great options available today. Modern technology, combined with a competitive market, means that there is no shortage of incredible manufacturers making excellent guns. Taking that into account, we've tried to outline the pros and cons of the different available options that we personally own or have used a great deal. Okay, I lied. 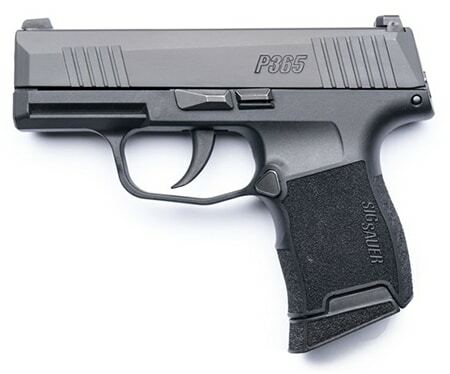 I'm starting the list off with a double stack pistol, the SIG Sauer P365. "Why?" you ask? The P365 is somehow as thin as the single stack pistols on this list, while having a magazine capacity of 10 rounds (flush magazine) or 12 rounds (extended mag). The major drawback of the P365 is its price, but if you think about what you're getting for the money, the price seems a lot more reasonable. First of all, in terms of magazine capacity and thinness, this pistol is a unicorn. Aside from that, it comes stock with tritium 3-dot night sights and an above average trigger. Additionally, it has slide serrations on both the front and rear of the slide. This saves you from having to spend additional money on the most common upgrades of other pistols on this list. The P365's biggest issue, that's not really an issue with the firearm itself, is availability. This gun is so popular right now that it's difficult to find them in stock, both online and locally. You may want to check out other sites, like Cabela's if Brownells is out of stock. I'll finish off by saying that I'm a big fan of SIG's ergonomics in general and that the grip and grip texture of the P365 are great. While still being relatively comfortable to shoot, the Beretta Nano is the most compact single stack pistol on our list. With its 6 round magazine, the Nano has smaller measurements in length, height, and width than any other option listed here. To give you an idea of how small the Nano is, comparing it to the Glock G43, which has the same capacity, it's shaved off 0.43" in length, 0.08" in height, and perhaps most importantly 0.16" in width. This makes the Beretta Nano the truest "Pocket Pistol" on our list. It also has an 8 round magazine, for greater capacity, but a taller overall height. While the price of the base model is very affordable, Cabela's also offers a version with Trigicon night sights which I'd recommend (or get them separately here). I'm also a big fan of lasers for concealed carry pistols and Crimson Trace offers one for the Beretta Nano. I'm a huge fan of Walther Pistols and my thoughts on the PPS M2 are no different. Like all Walther pistols, the PPS M2 has fantastic ergonomics and a great trigger, with short travel time and a fairly light trigger pull. Another common feature of Walther pistols, including the PPS, is relatively deep front and rear slide serrations which make it easy to rack the slide. The PPS M2 comes with two magazines, a 6 round flush magazine and a 7 round extended magazine (pictured left). There's also an 8 round magazine available, which can be found here. Keep in mind, the extended magazines mean a taller overall pistol. The rear of the PPS also has a red cocking indicator to help indicate whether there's a round in the chamber. All in all, I love the PPS for a single stack pistol and feel that it shoots flat for such a small, lightweight firearm. It is, however, a bit larger than most of the pistols on this list. While the PPQ (and all the other pistols on this list) are great, there's a few potential aftermarket accessories I always recommend for pistols you plan on concealed carrying. If not running a red dot, tritium filled night sights are a must in my opinion. They glow in the dark, making it possible to see your sights day or night. I'm also a fan of laser sights for concealed carry. Unlike the PPQ, the PPS comes standard with metal sights, which is nice. Despite this, I prefer to have tritium night sights, for which I'd recommend this Trijicon set (see on Amazon or Brownells). I'd strongly recommend this set up instead of getting the PPS M2 LE Edition, which has phosphoric night sights. To avoid straying too far from the focus of this article, I'll just say "tritium > phosphoric acid for night sights." As far as lasers go, you can't go wrong with Crimson Trace's laser sight for the PPS M2. I'd strongly consider opting for this bundle which includes a Blade Tech holster that is meant to fit the PPS M2 with a mounted laser. Generally speaking, Glocks are the go to recommendation for striker fired pistols in nearly any category. The Glock 43 offers the reputation and reliability of Glock to an ultra compact package. This pistol is incredibly popular among concealed carry holders. Now I must first admit I'm not the biggest fan of Glocks generally, but with that said, I really don't think there's anything too amazing about the G43. At around the same price as the SIG Sauer P365, it's somehow both wider and carries 4 less rounds in its magazine. While Glocks are known to be incredibly reliable, any of the pistols on this list are at the least very close in reliability. If you are, however, one of the many diehard Glock fans, check out this G43 with night sights. With only a 6 round stock capacity, you may want to consider getting a magazine extender. As always, I'd also recommend a Crimson Trace laser if it's in your budget. The entire Springfield XD line of pistols is fantastic. I've personally found them all to feel incredibly comfortable and easy to shoot. Like Glocks, Springfield pistols are frequently recommended for concealed carry, and in this case it's a recommendation I can actually get behind. The most notable feature of the XD series is the grip safety. While not everyone is a fan, it adds an additional level of safety for those that feel the need for it. It is, however, removable if you end up not liking it. The XD-S is one of the largest pistols on our list in terms of length and height, but also one of the thinnest. For those who are fine with concealing the size, you'll find that it's a lot more comfortable to shoot than many others on the list. It comes with both a 7 round flush magazine and a 9 round extended grip magazine. For just slightly more than the base model, Brownells offers the XD-S with Pro-Glo Tritium night sights. The Smith & Wesson M&P9 Sheild is another wildly popular concealed carry pistol that I'm not the biggest fan of in its stock set up. I do have friends that own them and love them, but I also know a couple people who have sold theirs and chosen to carry something else. Personally, my biggest complaint is the weird trigger, though that of course could be swapped out. What I do love about the Shield M2.0s is their aggressive grip texture. I wish more manufactures would take note of this. To the left, we've listed the M&P9 Shield with night sights, but you can also find them in a lot of other set ups at Brownells, including: With or w/o night sights, with or w/o thumb safeties, with or w/o lasers, etc. Along with Glocks, M&Ps have the largest variety of aftermarket parts. If you're in the market for a single stack 9mm pocket pistol, we'd actually recommend opting for the SIG Sauer P365 double stack pistol, which is nearly as thin as most of the single stack options and has a greater magazine capacity. As far as what's technically the best single stack 9mm pistol, we'd opt for either the Beretta Nano or Springfield XD-S. For those wanting the smallest available option, go with the Beretta. For a larger, but more comfortable to shoot option, the XD-S is great.